Ad van der Nagel was born in Rotterdam in 1903. At the age of 18 he was drafted into military service and decided to join the navy in the Dutch East Indies. December 1921 he left Rotterdam and went to Tandjong-Priok Harbour, Batavia. He was active mainly in the naval basis of Batavia and Soerabaja and was promoted to 2nd officer. In 1928 he went back to the Netherlands, but only one year later he returned to the Dutch colony. He became an assistant at Batoe Nanggar, a rubber plantation in North-Sumatra. Later he moved to Ngrangkah Pawon plantation in Kediri, East-Java. This plantation still exists and still produces and sells coffee. In 1933 Ad van der Nagel married M. Koen. As a former military man Van der Nagel was called up in 1941 and appointed quartermaster of the Landstorm in Tjilatjap, the only naval basis on the southcoast of Java. Early in 1942 he was taken prisoner of war by the Japanese, who took him successively to Tjibatu, Garut, Tjimahi en Soerabaja. 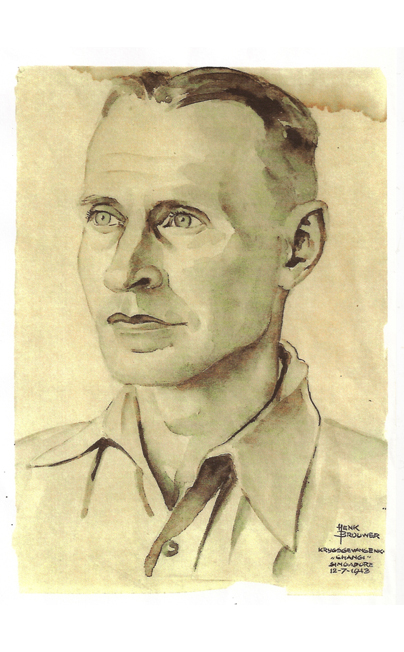 One year later he ended up in Changi, Singapore, where Henk Brouwer painted his portrait. Just like Henk Brouwer he managed to avoid forced labour at the Birma-Siam ‘Death Railway’, but was forced to work on the construction of the aerodrome near Changi. After the capitulation of Japan on 15 August 1945 it took until February 1946 before he could return to the Netherlands. Ad van der Nagel died in Nijmegen in 1990, 87 years old. The portrait of Van der Nagel was discovered in 2017 after our call in Aanspraak, the magazine of the Dutch Sociale Verzekeringsbank, in which we showed one of Brouwers portraits. Van der Nagels daughter J. Brugman recognized the style of Henk Brouwer. She then realised that the portrait of her father that she kept in her cupboard was designed bij Henk Brouwer as well.